Well now how did that happen? I took a blogging break over christmas and next thing I know its April! Oops. I’ve been having a lovely time in the studio of late. I’ve spent the last few weeks mixing up glaze tests. I’ve been working with the same tried and trusted glazes for years. They’ve been perfect for the kind of work I’ve been doing (and there’s nothing like reliability when it comes to meeting deadlines), but I’m after something a little different. Not wild and crazy different, just different to before. So I dug out all my old notes on glaze chemistry, hunted down my dusty glaze text books, set up my scales and sieves, and donned my dust mask (which is always a good look, especially after wearing it for an hour or so when its just that weeeee bit too tight). When I started studying ceramics I remember dreading the glaze chemistry subjects. Those baffling charts and calculations were a bit overwhelming to start with. But I surprised myself at how much I enjoyed it. Really, its kind of amazing what you can create by mixing up a few simple substances, and the possibilities are endless. So I’ve been having a ball getting back into it after all these years. All I need now is for a nice big gas kiln to drop from the sky and install itself in my studio. 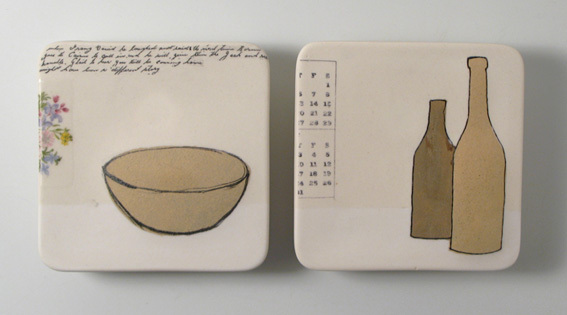 My trusty electric kilns are great, but electricity just doesn’t cut it when it comes to certain glazes. Ah well. Sometimes you just gotta work with what you’ve got. I’ve also been working on some new wall tiles (pics above and below). I’ve refined the form a little, made them bigger (a whopping great 10cm x 10cm), and have been playing with inlaying different stoneware clay bodies into porcelain and combining it all with drawings and decals. There's a bit more work to be done on these, but as with most things I make these days…slowly slowly. A few exhibitions coming up in the next couple of months (which I am shamefully behind in and starting to freak out about just a little bit!) but all going well I’ll have some images of new work to show you soon! And who knows, I might even blog a bit in between that! Good to see you back in blogland Mel! 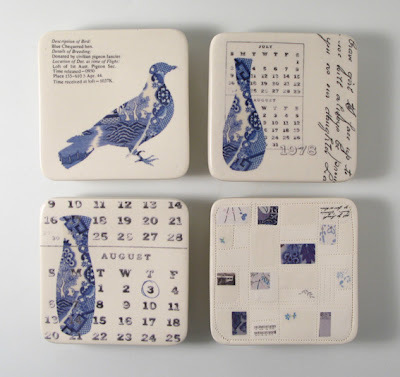 Your new wall tiles are beautiful. Inlay-arific Mel! The stoneware has a nice old school butchers paper kind of aesthetic that plays off well against the white of the porcelain. welcome back... i'd almost given up coming back to check! 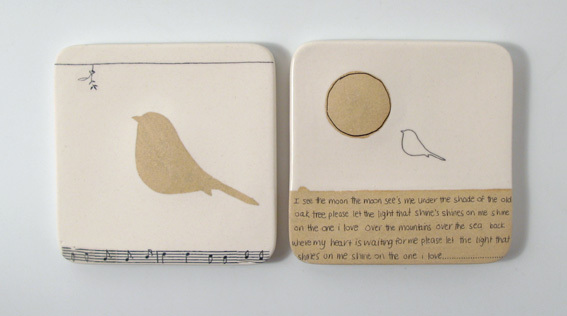 i'm an adelaide ceramicist - love your work and enjoy your blog. top job! Found you this morning all the way in Venice California via Design * Sponge. Love your work so much and beg that you open an Etsy shop. I have a hankering for those water jet cut blue birdies and flatware. Lovely stuff. So glad we've "met". You made my day! Found you via Design*Sponge as well and fell in love. Very unique art work. Do you sell them? Loving the brown bottles and bowls Mel- I've missed you too! I have two little birds like this hanging up in my kitchen. Perhaps they are yours? They were a gift and i absolutely adore them!! Your work is absolutely incredible. Seriously I want every single thing you make. Especially those wall tiles, I ADORE them.